Today I want to take the time to discuss an important issue that doesn't get talked enough about in the Kitchen and Bath design world. While I love sharing projects and trends with all of you, there are some trends that are less about looks and more about safety and health, and the composition of your kitchen cabinets is a perfect example. More and more homeowners are looking for formaldehyde-free kitchen cabinets. That’s because the cabinets made from pressed wood like particle board, hardwood, plywood paneling, and fiberboard typically contain formaldehyde. 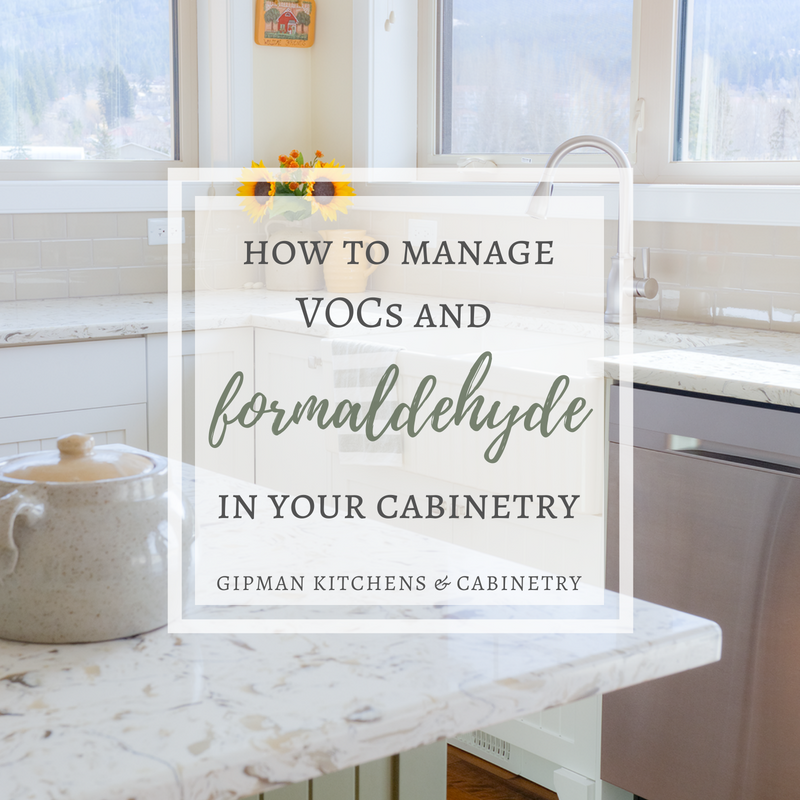 That’s a problem because formaldehyde is considered a VOC, or volatile organic compound. VOCs “off-gas,” which means they evaporate from their source and linger into the air we breathe. The federal government regulates formaldehyde as a carcinogen, and the Environmental Protection Agency considers it a significant source of indoor air pollution. Exposure to formaldehyde and other VOCs can cause watery eyes, a burning throat, headaches, other flu-like symptoms, difficulty breathing, and dizziness. Where do V.O.C.s come from? "Formaldehyde, a naturally occuring chemical present in human breath, is widely used. It has been studied extensively and is typically encountered in the home in low levels. All wood species, and therefore all wood products, contain and emit small amounts of formaldehyde. An oak tree, for example, emits 9 parts per billion of formaldehyde. It follows that any wood cut from that oak tree also contains small amounts of formaldehyde, as do all wood products. Formaldehyde also is found naturally in a wide range of fruits, vegetables, mushrooms, seafoods, meats and coffee. All cabinetmakers use composite wood in the construction of cabinets. It is an essential material for industry products extending the yield from the harvest of trees, making cabinetry more affordable. Composite wood generally is make with a small amount of urea formaldehyde adhesives in order to achieve durability and performance expected by consumers in the difficult kitchen environment that varies exposure to extreme heat, cold and diverse cooking products (mustard, ketchup, alcohol, and the like), detergents, water and heavy usage." Cabinets made from composite wood products, such as particle board or medium-density fiberboard, can be risky because they have most likely been produced using a urea-formaldehyde binder. In addition to off-gassing the chemicals they contain, if these types of cabinets are not manufactured and installed properly, they can susceptible to moisture and could swell or develop a mold problem. Solid wood cabinets are a safe choice ; however, they do carry a hefty price tag and do still contain organically occuring formaldehyde. Wood products labeled CARB compliant are a safe bet, as they meet the standards for reducing indoor air pollution set by the California Air Resources Board. The CARB product emission standards are the lowest in the world. There are wood composite products available that are low-VOC-emission certified, called NAF, no-added formaldehyde. It is important to recognize that products that carry the NAF guarantee do still contain formaldehyde. As explained by the NKBA, organic compounds contain small amounts of formaldehyde, and there is no way to completely remove them from the environments. These products must be specially requested before getting a proposal from your cabinet supplier as they do cost more than traditional cabinet materials. Not only is it important to discuss the contents of the wood used in cabinetry, it is just as important to discuss the finishes that are applied to them. The Government of Canada regulates the volatile organic compound concentration limits for architectural coatings such as paints, stains, varnishes, lacquers and other types of coatings that are available and applied to surfaces, including cabinetry. organic compounds. It is important to be aware of the products that are being used on your new cabinets. 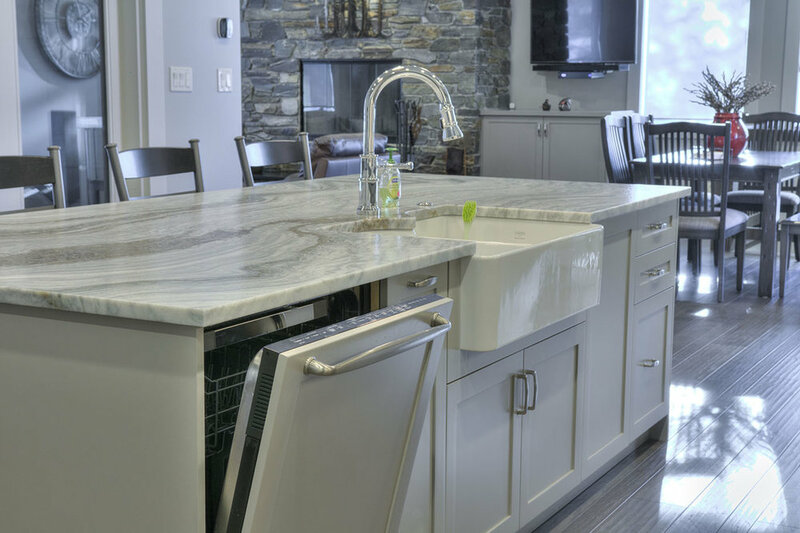 The best thing you can do for the health of your family and your home, is to ensure that your cabinet manufacturer uses water-based or water-borne finishing products. "Water-based" or "water-borne" is a term given to products that use water as the primary thinning agent. Most water-based products have a low-to-no voc emission rating that can be compared to other products. Custom cabinets are the healthiest option. You can work directly with your kitchen and bath designer to choose the wood and finishes that ensure the cabinets your purchase meet your priorities. Plus, you can create a manufacturing and installation schedule that makes certain that the cabinets are not installed until they are completely dry and odor-free. At Gipman Millwork, we use only wood products that are part of the FSP (Forest Stewardship Council) which sets the standards for what is a responsibly managed forest, both environmentally and socially. They have mandatory criteria that must meet the CARB (California Air Resource Board) and these products must be third-party tested to meet low-formaldehyde-emission standards in North America to qualify. Our finishing products, including all lacquers, stains and paints are all water=based products that are certified to be low-to-no V.O.C. emissions and the company who manufactures these products is on the front line on environmentally friendly technology. Complying with the strictest of standards in environmental and workplace health.